Airboats are fun! 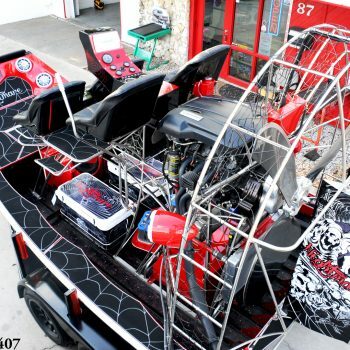 We have some boats ourselves that we have installed custom Seadek Non-Skid, waterproof speakers from Kicker, and Ocean LED lights just like on this customers boat. The customer already had Seadek installed, but has asked us to install a screaming stereo so they can hear the music from across the state. Kicker speakers and amp were installed in a matter of a couple of hours with custom mounting brackets. Music can now be controlled from a remote or a smart phone.